Let's kick off The Nordic Challenge with a chilly title, shall we? 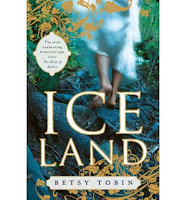 Ice Land by Betsy Tobin is set in Iceland just before everybody turns Christian. It focuses on a small group of Icelanders though there are a lot of points of view and it is confusing at first. The point of view of Freya is told in the first person, so you always know when she is speaking. Freya is a goddess who walks around with the regular folk like it's no big deal, except she's awesomely beautiful and flies around in a feather suit. Hanging out with Freya is often disconcerting. Sometimes she acts like a regular person and sometimes she's being all goddessy. The gist of the story is that Hekla, a volcano, is about to blow and destroy Asgard, the home of the gods. A seer tells Freya to find a magical necklace, the Brisingamen, created and kept by Dwarves that live deep in a mountain. Once she sees the necklace, she must have it. Getting and keeping the necklace ends up being quite challenging. Meanwhile, back at the ranch (literally), humans are having their own dramas. Fulla is an orphan living with her Grandfather, Hogni. The neighbours have been at war with Hogni's clan for ages. They've been giving each other the stink eye over the border for years and now the neighbours' chief is dead. His sons are antsy about expanding that border into Hogni's land. Everyone is waiting for the shoe to drop. Just to add to the drama, Fulla is in love with Vili, one of the younger neighbours. Hogni is desperate to sell, I mean marry, her off to someone else. Being a dutiful granddaughter, she is torn between her loyalty and her love. Honestly, I wondered what these two storylines had to do with each other until midway through a bomb is dropped that changes everything and brings Freya and Fulla together. I listened to Ice Land as an audiobook and had a hard time turning it off. Davina Porter is an excellent narrator though I thought she made Freya sound really old. This did not help me in trying to figure out how old she was: 30 or 3000 years old? (Not because Porter is an older lady, but her voice would sound older as Freya. At least to me.) It was discombobulating. In fact, I found the whole gods mingling with the humans confusing. Who is just a regular Joe and who is a Big Deal? And those gods got around. They were a lot of ladies' baby-daddies. I don't know much about Norse gods, and I'm thinking that's a good thing. Seems like there are some liberties taken with the mythology. If I knew anything, I think I'd be annoyed. Sometimes it's good to go into a book not knowing a thing. That said, I don't know what The Norns were but their presence is annoying. They are like the It's a Fact Girl from The Kids in the Hall, just popping up to make some random observation and then leave. That's all that really bugged me about the book. The story is beautifully told and quite lyrical. There is action and adventure, travels across Iceland through mountains and caves, fights and chases. Lots to keep a reader engaged. Plus, the descriptions of the landscape, the sulphuric pools, the lava strewn fields give a vivid imagery to the story. Ice Land has been compared to The Mists of Avalon. I can see the similarities: a strong female character, religious and political change, several points of view, ancient European myths. However, Ice Land takes more liberties with those old stories by throwing more regular people in the mix. Not everyone is a Merlin or an Arthur. I enjoyed Ice Land quite a bit and if you are willing to let go of any ideas you have about Norse mythology, I think you will too. I really enjoyed this book, probably because I have absolutely no ideas about Norse mythology. LOL! This does sound intriguing. I'm curious to know what the bomb is that's dropped that pulls everything together - not to mention that I've been struggling to get into audio books, and every single one I've tried has been awful. Wonder if I should give this one a go? I liked this book well enough, but like you I thought the two storylines weren't connected, and was thoroughly wrong-footed when it was revealed that they were. I don't know a huge amount about Norse mythology (less than I do about Greek, at any rate), but I didn't notice Tobin taking *too* many liberties with the stories. This definitely sounds different ... and I think I need to tell my son (who just discovered the allure of superheroes) about Freya -- she sounds pretty neat and superheroish! I have a print copy of this and have been wanting to read it. Davina Porter is usually a winner for me. Now I wonder if I should read or listen. Despite some of the negatives, I know nothing about Norse mythology, so perhaps ignorance is bliss here. It sounds like this could be an interesting change of pace, particularly as my knowledge of Norse mythology is very, very limited. Swapna- I think that's the best way to go into it. Aarti- Someday I'd like to read Beowolf. Coffee- Davina is a very good narrator. Fyrefly- Yeah, it came right out of nowhere. Iris- Give it a try! Jenners- There is a comic book based on Freya too. Beth- I enjoyed the audio very much. Ooooh I really like the sound of this one! I love strong heroines and even though I do know some Norse mythology I think I could stomach this one. I especially like that the audiobook was good because I need some more audiobooks. Hi, Chris. I was looking for your review of The Paris Wife, and I found this post. This book sent me up a tree! The Norn's knowledge of advanced plate tectonics was either annoying or hilarious, depending on how you looked at it. Anyway, this cracked me up!